The area known today as Old Highland was originally part of the Fort Snelling Military Reservation, which was claimed for the United States in 1809 by Lt. Zebulon Pike. In 1857, the area immediately north of Bassett Creek was separated from the Reservation, and opened for settlement. From 1857 through the 1860s, much of north Minneapolis was platted and basic traffic routes established. The major arteries became the present-day Lyndale Avenue and West Broadway (which had been a wagon trail that ran out to Osseo and linked to the Red River Ox Cart Trail to Pembina on the Canadian border). Many homes in Old Highland were built toward the end of the golden age of Minneapolis (late 1870s to 1893), so-called because of its exponential growth and financial prosperity during this time. 1. The local economy was booming, thanks to a flourishing lumber industry and an emerging flour-milling industry, both centered on the Mississippi River. 2. These successful industries meant that there were many jobs were available, bringing a great influx of people to Minneapolis from rural areas and eastern cities. 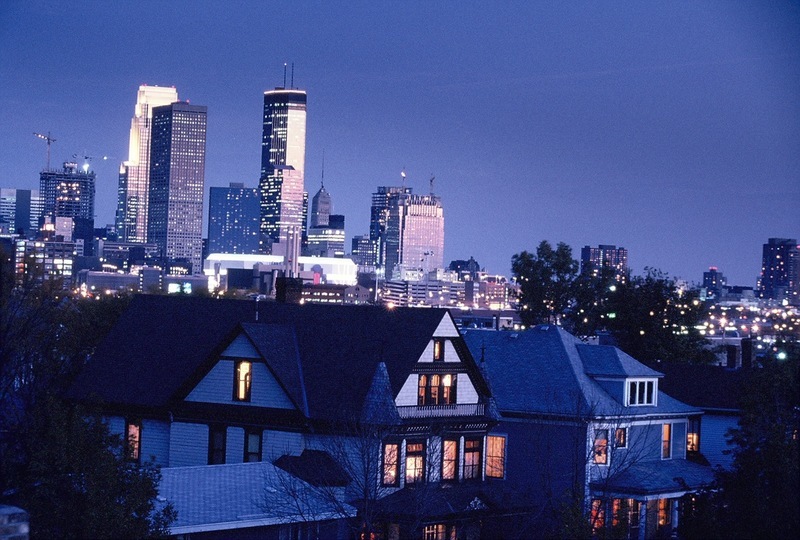 The population of Minneapolis more than tripled in the years between 1880 and 1890. 3. The existing housing stock was insufficient to meet the needs of these newcomers; and the resources (i.e. lumber and skilled workers) were available to expand. 4. The lumber industry's predominance on the North Side meant that the Old Highland neighborhood was well-situated to take advantage of growth, and many people associated with the lumber industry ended up making their homes here. 5. The proximity of a streetcar line along Washington Avenue North made access to the neighborhood convenient. This short-lived period of success ended in 1893, when a nationwide economic depression popped the bubble. Further residential expansion and infill construction would be with smaller, less elaborate homes. By 1898 the area was developed enough to support several churches, but land west of Girard Avenue remained vacant due to economic depression remaining from the Panic of 1893. As in many urban neighborhoods across the nation, people began to move out of the neighborhood during the 1950s and 1960s, for newer homes in the suburbs. Two developments during the 1960s and '70s accelerated the movement: the Plymouth Avenue riots of July 1967 which resulted in 34 arrests, two deaths, and the burning of four businesses; and the demolition of hundreds of homes between Dowling Avenue and downtown for the construction of Highway 94. Resettlement of the area by younger, lower-income families followed very quickly, in the early 1970s, but the existing housing stock exhibited the effects of age and became a target for clearance and renewal. A number of substantial dwellings were lost, being replaced by smaller buildings of modern design. However, many of the architecturally distinctive residences were reclaimed and renovated by local residents to retain the historic character of the neighborhood. The local group was informally led for many years by Charlie Nelson, an Old Highland resident who happened to also be the State of Minnesota historical architect. People like Charlie, his wife Angie Nelson, local resident and building contractor Greg Rosenow, and many other homeowner/preservationists have put in many thousands of hours of sweat equity on their own and their neighbors' homes, working by hand with traditional methods, and contributing to the city of Minneapolis an enduring and rich architectural heritage. "Though Minneapolis has lost all of its truly great Queen Anne houses, it has managed to retain a scattering of upper-middle class examples. Fortunately, there are several neighborhoods where one can still experience at least a partial streetscape of these houses. One of these areas is the 1500 and 1600 blocks of Dupont Avenue North; the other is situated on 2nd and 3rd Avenues South between 31st and 32nd Streets." Neet, Fred. Local Heritage Preservation Designation Study. Rep. Minneapolis: Minneapolis Heritage Preservation Commission, 1986. Print. The Historic Old Highland Tour has been made possible by the Arts and Cultural Heritage Fund through the vote of Minnesotans on November 4, 2008. Administered by the Minnesota Historical Society. The tour was written and edited in 2013. Additional thanks to Consultants Alicia Cermak; Brian Bushay; Robert Roscoe; Tammy Lindberg. Old Highland Neighborhood Association, “Introduction,” Minneapolis Historical, accessed April 18, 2019, http://minneapolishistorical.org/items/show/38.